A couple of years ago, the big players in the world of physical commerce were initiating their digital expansions with the acquisition of ecommerce sites. Examples of this were Waitrose with Ocado and Walmart with Jet.com, but the trend has now evolved. Pure play retailers have started to realise how well the online and offline worlds complement each other and are now trying to conquer the physical side. 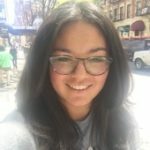 Whether it’s finding new sources of revenue, increasing their share of the market, expanding their points of contact with consumers, finding a new target audiences or improving their last mile solutions, combining online and offline is now more necessary than ever in a world where physical commerce and online commerce have become one and the same. Some pure play retailers have therefore backed strategic sectors, such as the food industry, estimated to be worth 8 trillion dollars and which benefits from a high probability of repeat buys. Therefore with the acquisition of established stores or the launch of their own concept stores that pure play retailers are slowly gaining ground in the food industry, with mobile spearheading the drive. Mobile allows them to bridge the two worlds so they can identify customers, and customers can find out more about products or make payments with with their phones. In 2017, pure players all but confirmed their desire to conquer the physical market. As a case in point, last summer, Amazon stepped into the market with its purchase of Whole Foods for a total of 13.7 billion dollars. Amazon also finally opened its checkout free store to the public on the 22nd of January 2018 in Seattle, after almost a year of delays due to technical issues. 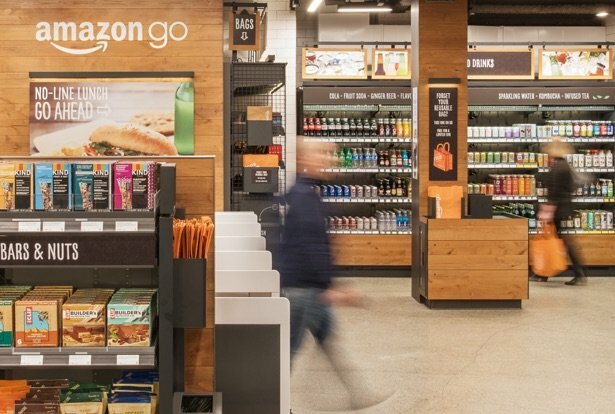 Amazon Go, at almost 170 m², allows consumers to buy groceries without ever having to queue to check out. They simply need to identify themselves when they enter the store with the Amazon Go app, before going in and picking up what they want to buy. With the help of cameras and sensors, Amazon can follow the customer to identify which products they take. Once they’ve finished shopping, they are automatically charged by Amazon and receive their receipt by email. Thanks to Amazon’s newfound position in the food sector, other major players are also jumping on the bandwagon. Walmart, for example, has announced that they too are working on a checkout free store called Project Kepler. The e-commerce giants in China are also following the same path, given the 765 million highly connected Chinese consumers available. As part of their ‘New Retail’ strategy, Alibaba invested in Hema Fresh in 2017, a hybrid store concept giving consumers an online experience in-store (Online2Offline). Specialising in fresh produce, Hema Fresh offers a connected buying journey to customers who can scan products to get more information or add them to their basket, and then show their virtual basket at checkout with a QR code, or pay with Alipay. The chain even commits to 30 minute delivery within a 5 km radius of the store. Moreover, during Singles’ Day 2017, Alibaba revealed their checkout free store prototype called ‘Tmall Supermart’, about which few details are available at the moment. According to some sources, ‘Tmall Supermart’ will work in much the same way as Amazon Go, with identification occurring upon entering the store with your mobile. Payment, however, will be done with facial recognition which would link the customer to their Alipay account. The Chinese giant has also partnered with other retailers such as Auchan which launched Auchan Minute, a 100% ‘phygital’ chain of convenience stores, available in China. No to be outdone, their direct competitor, JD.com, announced the roll out of their own connected convenience stores, 7Fresh, at the beginning of 2018, that would not need any staff to function. With the big digital players taking on the physical world, the e-commerce landscape is in a state of flux. While these big moves can’t be made by everyone, due to a lack of resources, and are only being carried out by the retail giants for now, the transition towards ‘phygital’ commerce is well on its way. They are applying an online to offline model to these, all while staying true to their digital beginnings. The goal is to consolidate consumers’ buying journeys, while eliminating the barriers that come with shopping in real life, like queues and having to pay at a dedicated checkout. It is therefore a good bet that these mergers and/or acquisitions will continue as the latest collaboration between Carrefour and Tencent proves, with their announcement coming out only last week, not to mention news of Walmart and Rakuten, Alibaba and Kroger and more.